HONEY AND HEMLOCK: Anton Chekhov: Atheist, Agnostic or Struggling Orthodox Christian? Anton Chekhov: Atheist, Agnostic or Struggling Orthodox Christian? The question of Chekhov’s Christianity and his relationship with the Orthodox Church continues to be debated. Even those such as Father Alexander Schmemann, who lauded Chekhov’s deep insights into the complexities of the human person brought about by his religious and medical backgrounds, could not confidently state that he was a man of the Church. This paper does not pretend to provide the definitive answer regarding Chekhov’s faith and piety. However, it does attempt to draw attention to his passionate struggle for the meaning of human existence and how, through his characters, one encounters a doctor and writer who tenaciously wrestles with Christ, the Church and the Gospel. This quest for meaning often leads Chekhov to those existential crossroads where, rather than choosing one particular path, he skillfully describes to his audience slices of life which offer glimpses into the pains, trials, doubts and joys of human existence. Like a jazz or blues musician, Chekhov offers spontaneous, dissonant, crisp and open-ended compositions, which often develop, from a character or set of characters seeking to scale the walls of personal loneliness and alienation. Delving into the personal traits and relationships of these characters, one can detect unequal intensities of darkness and light that Chekhov experienced in his own life and observed in the lives of others. One of six children, Anton Chekhov was born into a merchant’s family in the latter part of the 19th century. He was immersed in a culture that was on the one hand ostensibly Orthodox in its Christianity yet on the other hand, due to the political, social and religious reforms of Tsar Peter the Great, was receptive to the philosophical, spiritual and artistic trends of Western Europe. Contact with the West helped to catapult Russia into the center of European culture from which its intellectual contribution in the areas of science, mathematics, philosophy, literature and theology still remain to be appreciated. However, the culling and absorption of disparate worldviews and spiritualities into the salons of Russia’s cultural elite helped to generate a mood of religious confusion and restlessness that led, in some cases, to the abandonment of Christianity. Father Georges Florovsky characterizes the Russian intellectual’s often impatient and uncritical quest for religious experience as being “unorthodox, vague, dreamy, erratic, syncretistic... often a psychological mood or aesthetic rapture, or else a kind of moralistic psychoanalysis” that did not evoke a “sober and firm belief.” It is in this religious milieu that Chekhov lived and wrote. Certainly, one can use Chekhov’s own words to support his rejection of any kind of institutionalized and formalized Christianity. Using the above and other references to personal doubt and unbelief, the Soviets used Chekhov as one who exposed Christianity (and religion in general) as the opium of the people. Soviet literati and ideologues found a comrade in Chekhov whose work could be appropriated to further the cause of the Marxist/Leninist agenda. Yet, while Chekhov was definitely dissatisfied with the established Orthodox Church of his time, it would be too hasty to consign him to either the agnostic or atheistic camps. Even when he writes Diaghilev that he has “squandered his faith,” these words need to be put into a broader context. First of all, Chekhov, in addition to being critical of the established Church, was more averse to the mysticism and theology espoused by the intellectuals of the day. Though he praises Tolstoy’s religion rooted in reason and the brotherhood of man, Chekhov never made it his own. Regardless of what Chekhov wrote to Menchikov in praise of Tolstoy, his writings never promote a rejection of Christ’s divinity nor do they suggest an acceptance of Tolstoy’s rewriting of the Gospel which was founded on religious syncretism and philosophical rationalism. While open to new ideas and theories, Chekhov was not drawn to the spiritualities that captured the minds of his contemporaries. That Merejkovskii was a member of the Society of Religious Philosophy was enough for Chekhov to turn down the offer to co-edit “The World of Art Review.” For Chekhov neo-mysticism and theosophy rang “false and hollow” since, for him, they were not rooted in experience and did not focus on acts of charity. Though critical of institutional Christianity, the reader encounters through Chekhov’s characters a writer who neither rejects the Scriptures nor turns from the teachings of the Orthodox Church. Much of his writings show more than a casual or superficial interest in the liturgical calendar. So many of Chekhov’s stories have the feasts of the Incarnation and Resurrection as the context through which his characters reveal their personal uniqueness. Each character is opened to eternity and therefore cannot be defined by any predetermined anthropology. While seeking communion with the other, each character is continually developing in as much as there is an encounter with truth, evil, light and darkness. Paradoxically, Chekhov’s “squandered faith” did not drive him away from Christ. In spite of his dissatisfaction with established Orthodoxy and given his profound personal struggles with faith, he perseveres in the Orthodox Church. Chekhov’s oppressive religious upbringing nurtured by a stifling ritual formalism could not prevent him from seeing and experiencing the transforming beauty of liturgical celebration and its role in revealing the indissoluble bond of love between God and humanity. All of this warrants a closer look at how Chekhov sought to uncover through his characters a living Christianity in which God’s mercy and love opened the way to transfigured life. Ironically, or perhaps providentially, Soviet scholars in the 1970’s made available to a wider readership the complete and uncensored works of Chekhov. Though the critical apparatus of this invaluable contribution held firmly to a Marxist/Leninist hermeneutic, it nevertheless was a major step towards producing new impressions and studies of Chekhov. For Russian scholars, a re-examination of Chekhov’s Christianity would have to wait until the fall of communism. Beginning in the 1990’s scholars outside of Russia gradually came to an appreciation for what they saw to be more than a superficial deference to Christianity. In 1994, the Second International Chekhov Conference held in Badenweiler( the place of Chekhov’s death), focused on the philosophy and religion of Chekhov as presented in his life and in his work. In France, the Review of Comparative Literature (October 1995) dedicated an entire issue to the “New Faces of Chekhov.” In 2004, marking the centennial of Chekhov’s death, a conference in Melikhovo, located about 40 miles south of Moscow and home to Chekhov from 1892-1899, devoted itself to the theme: ‘Anton Chekhov, Yesterday and Today.’ Part of the conference included a visit to the newly and fully restored monastery of St. David (Davidova Pustyn) where Chekhov spent more than a little time getting to know many of the resident monks. Of these monastics, the hieromonk Ananias became the model for Father Sisoes in "The Bishop". In 2005 the journal “Le Messager Orthodoxe” published a collection of articles focusing on Religion, Culture and Sanctity. Among these articles is “The Christianity of Anton Chekhov According To The Published Stories For The Feasts of Pascha and Christmas” by Jacqueline de Proyart. This article is one of the more recent and most comprehensive testaments to the Christianity and Orthodoxy of Chekhov. 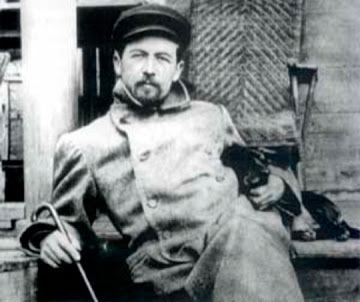 As an artist and as a doctor of medicine, Chekhov was open to, as well as critical of new ideas and movements. He was very interested in Darwin and like the Victorian biologist and philosopher Herbert Spencer (1820-1903) he recognized that art, science and religion were completely integrated. Consequently, for Chekhov all paths to knowledge led to the truth but all knowledge did not exhaust the truth. Professor Stephanovich’s broad range of knowledge ultimately leads him to loneliness. He becomes estranged from what he ostensibly loves. The question that emerges from Stepanovich’s introspection is “who or what is the god of the living man?” For Chekhov the answer rests in a personal God. The God of the “living man” is Christ who as incarnate love seeks to draw all to himself in a bond of interpersonal communion based on the new commandment to love one another(Jn.13:34-35). Stepanovich is alone because he ceases to love. Chekhov knew both the Old and New Testaments. The Decalogue’s censure against killing, the love for the peace maker in the Beatitudes and the acceptance of the incomprehensible nature of existence expressed in the book of Ecclesiastes contributed to the tone and vision of his writing. Clearly, for Chekhov, reality was in no way black and white. His personal suffering and his ever-increasing insights into the nature of the human person led him beyond the myopia of an ethical Christianity. He strongly embraced the words of Ecclesiastes – vanitas vanitatum, omnia est vanitas – to ensure for himself that the mystery of life and therefore the mystery of human person would not be compromised nor exhausted. The human person’s ever pressing desire to enter and experience the mystery of life permeates the works of Chekhov. Through the beggar Grigory Liharev, one of the main characters of “On The Road” (1886), the reader unexpectedly encounters the profound sentiment of an all-embracing love of life. For the unreliable Liharev “the meaning of life lies in unrejected martyrdom, in the tears which would soften a stone, in the boundless, all forgiving love which brings light and warmth into the chaos of life.” Love and forgiveness are Christ like qualities that narrow the gap of human separation and overcome the horror of existential loneliness. Liharev’s words are directed to Mademoiselle Ilovaisky, a self centered one-dimensional woman who by chance encounters the articulate beggar in a train station during a snow storm on Christmas Eve. Listening to Liharev’s words about unconditional love and forgiveness – themes central to the Nativity Event – Mlle. Ilovaisky encounters a brief moment of ecstasy. In this moment a communion of persons is forged which allows her to catch a glimpse of the depth and mystery of life; “She gazed wonderingly into the darkness, and saw only a spot of red on the ikon and the flicker of the light on Liharev’s face. The darkness, the chime of the [church] bells, the roar of the [snow] storm, the lame boy, Sasha with her fretless, unhappy Liharev and his saying – all this was mingled together and seemed to her fantastic, full of marvels and magical forces. All that she had heard was ringing in her ears, and human life presented itself to her as a beautiful poetic fairy tale without an end.” God’s beautiful and wonderful world is brought to Ilovaisky by a wandering man who has no place to rest his head. For Chekhov human dignity is not achievable without Christ. In the encounter with Christ the human person, susceptible to sin and bound to death, is led into a new life founded on divine love and forgiveness. In his play, "The Cherry Orchard" (1904), the year of Chekhov’s death, there is an important but oblique reference to the transforming love Christ offers to each person. Towards the middle of Act III there begins (again) unexpectedly, during the course of a ball, the recitation of Alexis Tolstoy’s "The Sinful Woman" (1857). The stage directions allow for one of the guests, the Station Master, to recite a few lines of the poem until he is drowned out by a Viennese waltz. In the context of the play, the poem is an intrusion into the lives of people who will soon have to face the uncertainties and fears of a new life no longer moored to the familiar and formal rhythms of the past. By inserting this poem in a subtle if not cryptic manner, Chekhov reaches out to the audience, reminding them that Christ himself is a kind of subtle and cryptic intruder who, when finally discovered and welcomed, changes one’s life forever. Chekhov uses Tolstoy’s poem to capture how Christ unsettles the life of Magdalene and ultimately draws her into the unending mystery of new and transcendent life. The poem, silently placed in the context of the play, attests to the dying Chekhov’s conviction that only Christ can save – only Christ can restore beauty, dignity, meaning and life to himself and to others. The Other approaches her home. He places his saddened gaze. And for the first time, evil became a horror to her. And His pardon and mercy. Before the holiness of Christ. The works of Chekhov present a series of moments that point to the yearning and need for interpersonal communion. In these moments Chekhov himself points to how the relationship of persons rooted in the truth and love of Christ cannot be bound to any fixed or unchanging belief. In the words of Jacquline de Proyart Chekhov’s faith and Christianity “cannot be constrained in an ensemble of certitude inculcated by a channel of authority, [or] closed in a system of devotions and of obligatory rites of a bureaucratic Church.” In reading the works of Chekhov one is able to see that certitude is only found in the ever changing dynamics of personal relationships and not in static systems, ideologies and philosophies that are imposed by any ecclesiastical institution unable to commune with the person. “The Quest For Religion In 19th Century Russian Literature, Three Masters: Gogol, Dostoyevsky, Tolstoy,” in Theology and Literature, collected works, Belmont, Ma. 1989, vol. xi, p.13. The Portable Chekhov, ed. Avrahm Yarmolinsky, Penguin Books, 1977, p.605. See also, The Selected Letters of Anton Chekhov, ed. Lillian Hellman, trans. Sidonie K. Lederer, New York, 2007 edition, pp.55-56. Cf. Jacqueline de Proyart, “Le Christianisme d’A. Tchekhov," Le Messager Orthodoxe, no.143, Paris, 2005, p.26. In “Chekhov Pievchii”[Chekhov the Singer], by Alexander Chekhov in Viestnik Evropy [European Messenger] 1907. Quoted by Princess Nina Andronikova Toumanova in Anton Chekhov, The Voice of Twilight Russia, Columbia University Press, 1960, p.13. Jacqueline de Proyart, op.cit. p.27. The Selected letters of Anton Chekhov, ed. Lillian Hellman, trans. Sidonie K. Lederer, Barnes and Noble Edition, 2007, p.262. Jacqueline de Proyart, op. cit., pp. 28-29. Ibid. p.2. In Melikhovo Chekhov also established ties with the privileged and underprivileged. As a landowner he dedicated himself to improving the lives of the peasants living on his estate. During an outbreak of famine and cholera in 1892, he provided relief and comfort to the peasants. In Melikhovo he also built three schools, a clinic and fire station. As a doctor he spent hours visiting the infirm – both poor and wealthy. Anton Chekhov, Stories, trans. by Richard Pevear and Larissa Volokhonsky, Bantam Books, 2000, pp. 104-105.